Veronese was born in 1528 in Verona, Italy. He spent most of his adult life in the city of Venice in Italy. The only known training he had that historians are sure about was from his uncle, Antonio Badile, when he was a young man in Verona. For most of his life when he was older he directed an art workshop, but he also worked in and at many places such as Veneto, the Doge's Palace, and the church of S. Sebastiano in Venice. The types of art he created were paintings and frescos, but mostly paintings. Among them were Temptation of St. Anthony, Christ Among the Doctors, and Triumph of Venice. His only known patron was the church itself, but since he painted some pieces containing pagan figures, there was most likely another patron. The name of this painting is The Resurrection. It was painted somewhere between 1550 and 1575 and is located in Gemäldegalerie, Dresden, Germany. It shows the resurrection of Christ, which is a significant event in history for Christians. The Resurrection was painted with oil paint on canvas. It depicts Christ resurrecting from his tomb. The people around him seem startled and shaken by what is happening. It appears that they are shielding themselves from the light coming from Christ. This picture shows idealism, which is the idea of how things should be. It is the of perfection and clarity, and simplicity and eternal order. The painting shows Jesus rising to the heavens after he has died for our sins. The fact that now, all could go to heaven if they asked for forgiveness shows clarity and perfection. It also shows eternal order in that everyone was put in their rightful place in the end. I like this painting because it gives me hope and fills me with love. It's the concept that I like, not really the actual picture; I don't like the colors. It reminds me that Jesus loves me enough that he died for my sins, and that one day I will go to heaven. You can find a copy of this picture in the link I've provided here. "Paolo Veronese." Encyclopedia of World Biography. Detroit: Gale, 1998. Biography in Context. Web. 1 Dec. 2015. "Paolo Veronese." International Dictionary of Art and Artists. Gale, 1990. Biography in Context. Web. 1 Dec. 2015. "The Resurrection of Christ C. 1570." 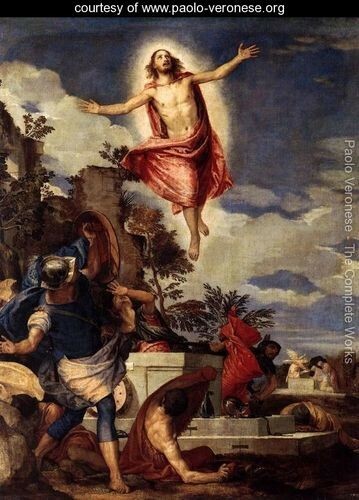 The Resurrection of Christ C. 1570. N.p., 2002. Web. 03 Dec. 2015.